MAN Truck & Bus celebrates 100 years of existence as a globally recognised commercial vehicle manufacturer at the Big 5, the Middle East’s largest building and construction show, which starts today in Dubai. MAN’s anniversary milestone, heritage and expertise in vehicle manufacturing will be the main highlights at the MAN stand. MAN is taking the opportunity to showcase a truck manufactured in 1961, reflecting its rich history, three of its robust construction vehicles from across its current range and also a vehicle, which will be the truck of the future in the Middle East, the MAN TGX. At the Big 5, MAN will also launch its new telematics system MAN EcoStyle for the Middle East, which has been developed to improve fleet performance. MAN will also showcase the ProfiDrive concept as well as its TopUsed solutions. In addition, a digital walk-around enlightens the visitors about the latest MAN truck safety features. At Big 5, MAN will display the EURO 5 TGX 6x4 tractor head which is not only greener but also more powerful with up to 540 hp. With a gross vehicle weight of 33 tons and gross combination weight of 180 tons, it is the ideal unit for heavy transport requirements of the construction industry, whilst equally capable catering for the specific demands for long haul operations. The MAN TGX represents the future for the Middle East and has already been fully adapted for the local market. This generation of truck will be more fuel efficient and at the same time reduce exhaust emissions significantly due to the optimized exhaust gas cleaning process. Series delivery of this type will be launched in late 2016. Among the highlights of the current range, MAN displays its most robust vehicle, the TGS 41.480 8x8 truck which is specially designed for usage in rough off-road conditions such as the desert. The vehicle can be used in various application for example oilfields, maintenance of high voltage cables, construction crane operations and many more special off road tasks. The smaller version of this truck is also exhibited on the stand. The TGM 18.240 4x4 comes with a cargo body and crane for off road works in most difficult off terrains. The third truck of the current range is the TGS 40.360 6x4 mounted with a 9cbm concrete mixer for efficient and reliable concrete transport. 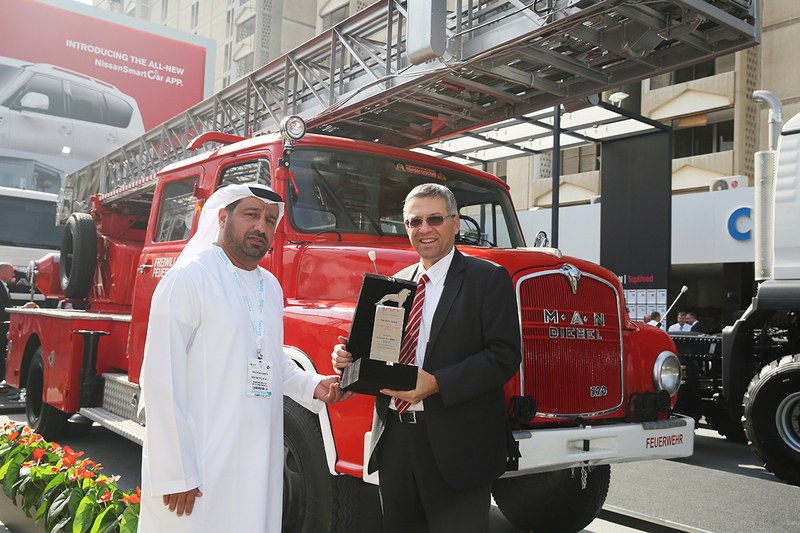 The centre piece of MANs history is the MAN 520 L1 4x2 historical fire fighting vehicle, model year 1961. The truck has been operating in Germany until the late 80s and has been shipped to UAE in 2015. It has been fully refurbished by the service experts of Darwish Bin Ahmed and Sons, MAN´s exclusive Importer in Abu Dhabi. The historical truck has a maximum power of 120 HP and the most fascinating equipment is the extendable ladder which is still operated manually. The cabin inside including the bench is wooden and has space for 6 firefighting crew. MAN is also launching its new generation telematics solution, MAN EcoStyle with its partner Microlise. The system has been designed to help transport operators to improve driving standards, reduce vehicle wear and tear, enhance safety levels and improve vehicle health, as well as reduce overall operating costs, emissions and fuel usage. One more highlight at the stand is the digital safety walk-around where the experts from MAN demonstrate the latest safety features which help to prevent accidents such as the lane guard system, adaptive cruise control and ESP which can help to prevent a significant number of accidents. MAN's ProfiDrive training model will also be showcased at the Big 5. It is a specialized training program, designed to raise the level of knowledge so that drivers can adopt the best driving practices for the prevailing road or traffic conditions. Through a ProfiDrive training seminar, drivers learn predictive driving techniques such as how to recognise dangerous situations, calculate the optimum stopping distance and evade obstacles that suddenly emerge. MAN has been offering the service to its customers in the Middle East for on-road operations since 2009 and is now also offering an off-road training module to cover all aspects of truck operation in the region. Visitors to the MAN stand will also get to know more about MAN TopUsed service which can provide high quality, used commercial vehicles from MAN for regional customers. Customers who buy TopUsed vehicles get a purchase warranty which gives them top quality vehicles at a fair price while being thoroughly checked and certified from MAN.